Bayou Bliss is also located in Nature's Landing Condominiums in Cedar Key, near Mud Flat Molly's. Located on the second floor, your private balcony overlooks the marsh and waterways of Cedar Key. There's even a swimming pool to enjoy and an elevator for your convenience. The bedroom is furnished with a king-size bed. Bayou Bliss is located on the bayou side of Cedar Key, about a 10-minute walk from Dock Street and the Dilly Dally Gally. Bayou Bliss is $115/night, based on double occupancy. The rate does not include an additional 9% sales tax. 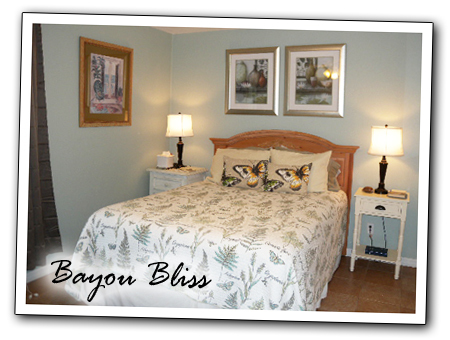 Bayou Bliss can accommodate up to 2 people.